Michael McFadyen's Scuba Diving - Cape Banks Caverns The outer northern headland of Botany Bay was named in 1770 by Lieutenant James Cook, RN, Cape Banks after Sir Joseph Banks who was the first European to record the flora and fauna of New Holland (or New South Wales as Cook was to later name it). Cape Banks has the remains of a shipwreck on the inside rock platform. This is the SS Minmi. A collier, the Minmi was on its way from Melbourne to Newcastle when it hit the outside of Cape Banks on 13 May 1937. As can be seen, the main hulk of the wreck now lies above high water mark on the rock platform, but pieces of the ship can be found over the eastern side of Cruwee Cove (the bay inside the headland) and around the Cape. These remains include metal plate, timber pieces and steel. 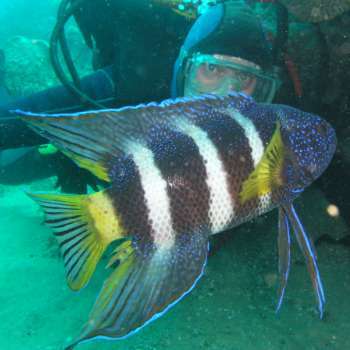 I have been told there are other bits in very shallow water on eastern side of Cape Banks, but I have not been able to find any on a couple of dives in this area. The length of coast north from Cape Banks to Maroubra Beach has some of the most underrated dive sites in the Sydney area. As well as the now famous MV Malabar, there are great dives at The Pistol Crack, Isolated Cemetery and Tupia Point (amongst other sites). About 50 metres south of the tip of Cape Banks at GPS Reading 34° 00' 09.6"S 151° 15' 00"E (note that all my GPS Readings are using AUS66 - if you use any other datum, you will need to convert the reading - see my GPS Page for more details), there is a dive spot that is the equal of any dive site I have visited in Sydney. Run in from the sea and anchor at the location mentioned or when the depth comes up to 15 metres or so and then 12 to 13 metres. 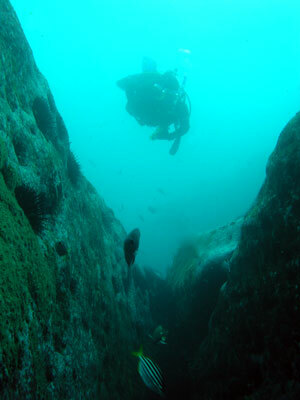 The terrain here is quite varied, with the depth going from only a few metres down to almost 30 metres further offshore. If you anchor in the location mentioned above, you will find that there are gullies, holes and caves galore. Most of these are to the south of this anchor spot but some may be to the north. In addition, there are some very nice walls, with the depth going from 5 metres to 13 metres and from 13 metres to over 20 metres. There are some nice overhangs and some excellent swim-throughs. I have found more than six good sized caves/tunnels and I am sure that there are more. The gullies are quite large, with some being more than 30 metres long and 10 metres wide. Their depth is often 10 metres or so. In the gullies there is usually excellent fishlife, including yellowtail, sweep, one-spot pullers, all in large numbers. In Winter they are home to Port Jackson sharks in large numbers (up to 20 in a group). I have also seen eastern blue devilfish in the caves and overhangs. Deeper there are sea dragons. If the seas are calm, you can dive in very close to the headland. Here there is prolific fishlife, including bream, luderick and eastern rock blackfish. Beware of the many fishers who are nearly always fishing along this section of the coast, as it is easy to get entangled in their lines and even easier to upset them. Anchor 30 to 50 metres to the north of the point on the outside, about 30 metres off-shore in a depth of about 15 metres. In summary, a great, exciting dive site, worth many dives.